The Company reports that the northern part of West Sophia is dominated by volcanic and sub-volcanic dykes within the serpentinites. Of the four vertical holes drilled in West Sophia, two holes (1 and 3) disclosed volcanic and intrusive rocks (basaltic andesite to diorite) from overburden contact to end of hole with no ultramafic rocks being observed. The assayed results from the West Sophia drilling program are summarized in the following chart. non-sulphide minerals as total nickel. base of serpentinite intersection underlain (undercut). The Company reports that one drill hole was completed to the depth of 267 metres on its Golden Drip property. The purpose of this drilling was to find a possible vein system near the volcanic (andesite) serpentinite contact in the Golden Drip property which is parallel to the known veins in the contiguous OK and IXL workings. The drilling results for the Golden Drip property were not encouraging as management determined that the volcanic rocks in this hole are not a part of major volcanic lava but rather dikes or sills injected within the serpentinites. Two quartz veins were assayed and the results are summarized in the following chart. Six vertical holes with 100 metres spacing were drilled in the Company's Record Ridge South property. The Company reports that holes 1, 4, 5 and 6 on a 100-metre square grid encountered ultramafic rocks and returned broad zones of magnesium, nickel and cobalt bearing serpentinites from the surface or near surface to the depth of 55 metres to 137 metres, averaging just over 100 metres. As set out below, the magnesium values of the near surface serpentinites for those four holes range from a low of 22.4% in hole 1 to a high of 26% in hole 5, averaging 24.5% magnesium. Hole 1 also includes nickel and cobalt bearing zones within the serpentinites. However, it should be noted that this nickel bearing section lies at a deeper level of approximately 172 metres below the surface. 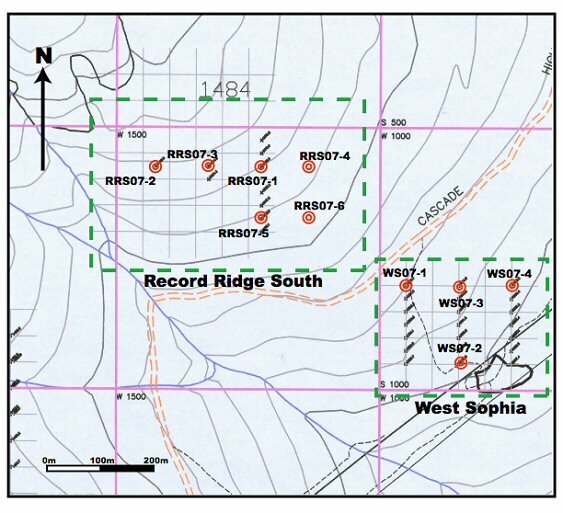 Based on the results to date and as a result of easier access, the Company advises that it will continue with its drill program on the Record Ridge South property in the summer of 2008. The Company's field activities are supervised and the technical data for this report was prepared by H. Kim, P.Geo/P.Eng (Practicing), the Company's on-site Geologist. The Company plans to commence its 2008 drilling program in May with drilling being conducted on the Company's Midnight, Golden Drip, Record Ridge South, West Sophia and Hidden Valley properties. The Company plans to drill approximately 40 drill holes in the 2008 program.